Have you seen the movie ‘The Minimalists’? It’s pretty awesome. I’m going to go out on a limb here and say you’ll likely be like me the first time you watch it and think ‘oh no I couldn’t do that!’ and then over the following weeks start looking around your house with new eyes. You might find yourself Googling minimalism or taking a peek on The Minimalists’ blog. Once you catch the ‘bug’ it’s pretty hard to shake. It’s something I hope I take with me forever. It’s not just about getting rid of actual physical stuff though, if I had to sum it up I’d say it’s getting rid of anything you have, think or do that you don’t love (as long as it’s not necessary, sorry no ditching the washing unless you hire someone to do it I suppose). You have to do a bit of thinking to narrow down what’s really important to you then you have a filter for everything that you come in contact with. For me happy and healthy are high on the list. If something doesn’t make us happier or healthier then it’s usually a no. Attempting to grocery shop with two kids – not something that makes me happy. It is quite the opposite. 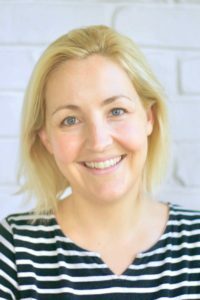 Occasional trips to the farmers markets as a family or just with one child – good, sometimes rather pleasant, ducking into the shops to get one or two items with the two of them – try to avoid but ok if needs be, big shops with the two of them – avoid at all cost unless I want to have a meltdown in the middle of the supermarket. As my mum says ‘you got to know your limitations’ and I know I don’t do grocery shopping with the two kids if I can at all help it. So how do I get the groceries? I grocery shop once a month. Yep you read that correctly, once a month. When I first heard of once-a-month shopping I thought it was a ludicrous idea but nearly a year in I am a convert. Now I’m going to say this right now at the start, that once-a-month shop is not for absolutely everything for the month. 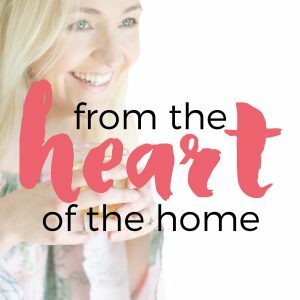 It’s for everything that will last a month – so I’m talking pantry staples, things like yoghurt that have a long expiry date, toiletries, cleaning supplies, frozen things or anything that can be frozen like meat which I portion and freeze. 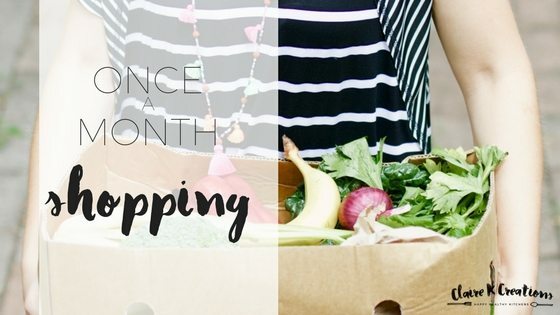 This one is pretty obvious but if you’re only doing a big shop once-a-month then it’s saving you a tonne of time – the trip to and from the shops, the shopping, check out, packing it all into the car, unpacking and putting it all away at home. 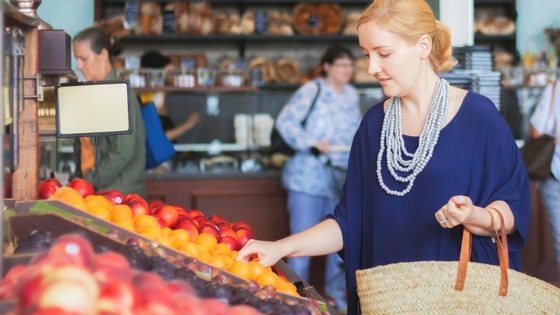 Yes you might be getting the same amount of stuff in four different shops, but combining it all into one visit to the supermarket saves time. It also means you don’t have to be at the supermarket every weekend so you’re free to do whatever you like. Who am I kidding, free to do whatever the kids would like you to do. Fewer shops means you inevitably spend less. I don’t need to tell you, you go to the supermarket for 10 things, you come out with many many more. 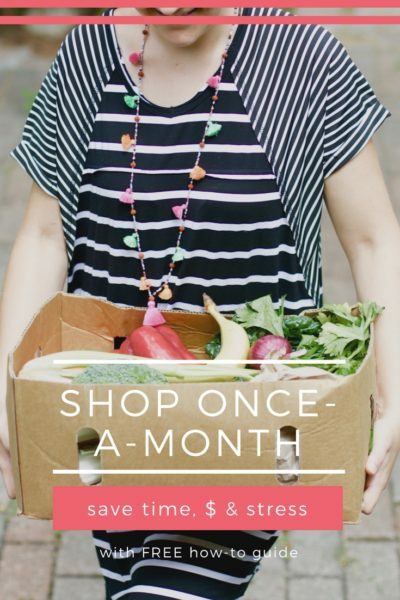 Yes you do miss out on some of the specials when you only shop once-a-month but once you get the hang of it, you’ll find the best ways to buy your items. To combat buying extra bits and pieces when we pop in for milk, we try to use cash. When you only shop once a month you have to be a bit more organised and forward-thinking in your cooking. It doesn’t take that much more effort to get into the habit. It also forces you to plan ahead. I always look at my calendar for the next four weeks before the big shop. Is there an event coming up that I will have to take a specific dish to etc? It means there’s no racing to the shops at the last minute for things like this either. Organised and prepared sort of come hand-in-hand I think. If you shop once-a-month, unless it’s a few days before shopping day, if something happens, like the crazy aftermath of a cyclone that we had last week, you’re not rushing to the shops to stock up and battling the crowds and weather. We didn’t need a thing (ok Will went out for beer but that’s it). Supermarket shopping just stresses me out these days if the boys are involved. Ollie has entered the beginning phase and Cooper is currently in the tear-the-shelves-apart-and-climb-out-of-the-trolley phase. Yep I end up as that Mum I’m sure other people are judging while I run around like a crazy woman trying to keep the kids under control and balance a bottle of milk. It’s also less stressful because you’re more organised so no having to pop out to the shops at the last minute. There are always ingredients to make at least a few different things. Now I’m an avid grocery-store-avoider, I’ve become more creative in my cooking substituting what I don’t have with something I have on hand. It forces a bit of creativity and I think has actually improved my cooking skills. You’ll have to ask the family for the verdict on that one. The short answer is yes, the long answer is not all that much and usually I can survive. See above – I get creative. Sure it’s not foolproof but it is working for us and when it comes to life with kids, I have learned that finding something that works for you is the key. Menu planning makes this method even easier. What about you? How do you shop? 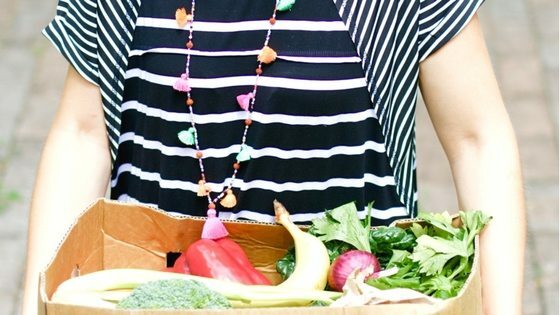 Would you be willing to give once-a-month shopping a go. If you would, I’ve created a free getting started guide. Enter your details or click on the pic below to grab your copy. 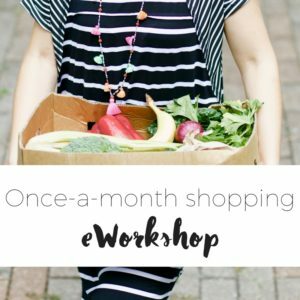 Or, if you really just want to get started and want to know exactly what to do, check out my once-a-month shopping eWorkshop where I’ll take you through the process step-by-step. 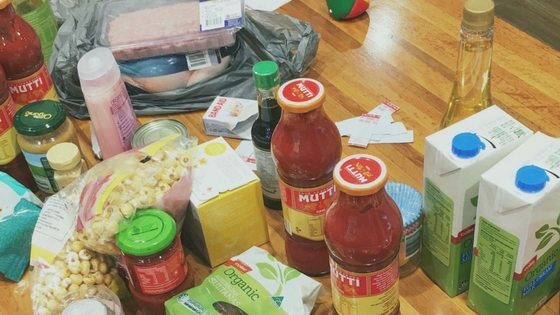 I’ve been shopping like this for years – now only have 21 yr old male at home with us and he does complain that there are things missing – “why don’t you go shopping every week like normal people?” is normal complaint now he does most of his own cooking. My retort is “leave me a note when you finish something”. So interested to read your guide. Haha ‘normal’ people. I’m sure I’ll get comments like this one day. But maybe mine will be used to it after growing up with it.